This page is my running diary for 2007. Clicking here will scroll this page so you can see how the year finished. My running goals for 2007 - Track: 1500m in 5:27, 3000m in 11:40 and 5000m in 20:46. 10k road in 43:33. Gold Coast Half Marathon in 95:29. Nail Can Hill Run in 56 minutes. City to Surf in 62 minutes. Six Foot Track in 6:30:00. 1 Jan 9.3 Speedygeese. Missed early warm-up... cleaning garage after it was flooded in last night's storm. Session a relay - 820m 'hard', 400m jog. Very tired. Could only run at a moderate pace. Cool, windy. 2 Jan 12.6 Calwell, decided not to do a track session due to tiredness and a niggly back. Easy the long way to Rose Cottage Inn and back in 78:42 (6:15/km), Ave HR 127. Cool and windy. 3 Jan 11.4 With Chris from PH - normal run long way around Central Basin plus extra around PH at finish. 64:29 (5:39/km). Ave HR 138, MHR 143. About where I was before Christmas :) Cool, easterly wind. 4 Jan 7.1 First, at Calwell: 2.5k warm-up, 15:34. Later, AIS Interclub/Masters... 3000m as Slow Race Test in 15:43 (5:14/km), Ave HR 138. This is 34 seconds quicker than my best for this test on the grass at Calwell. Splits: 4:57, 5:14, 5:32. Later, 4 lap 'spiral' race walk 1,644m in 9:18 (5:39/km). Mild, still. 5 Jan nil Rode mountain bike to Isabella Plains. Incredible damage to the storm water drain caused by Sunday's storm - about 150m of concrete ripped up. 12k easy at HR under 100. Warm, still. 6 Jan 24.6 Steve's 6' group from Molonglo. 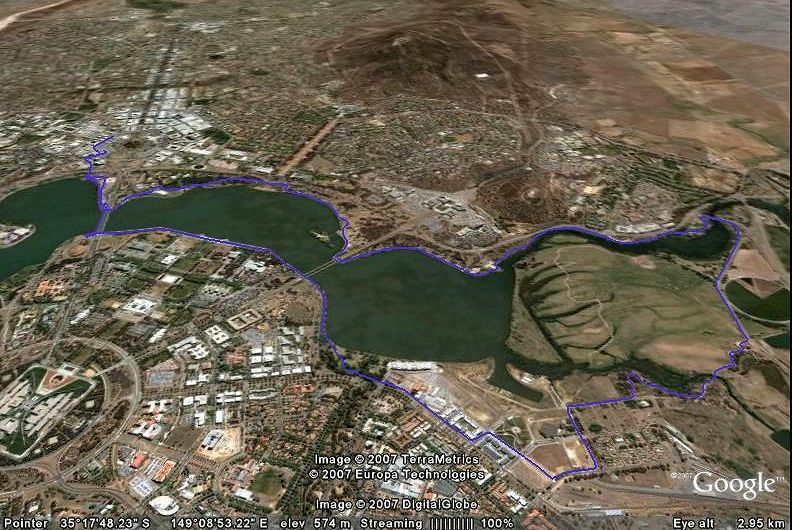 7.10am, around Mt Ainslie, Trent's, Zig-zag to 4 Ways, back via Campbell Park, Duntroon short-cut in 2:53:11 (7:02/km). Ave HR 131, MHR 142. Walked Trent's with Steve, John and Ruth. Last 10k with Ruth, stopping at Campbell Park for water. Warm, 24C and still. 7 Jan 15.1 3.20pm. 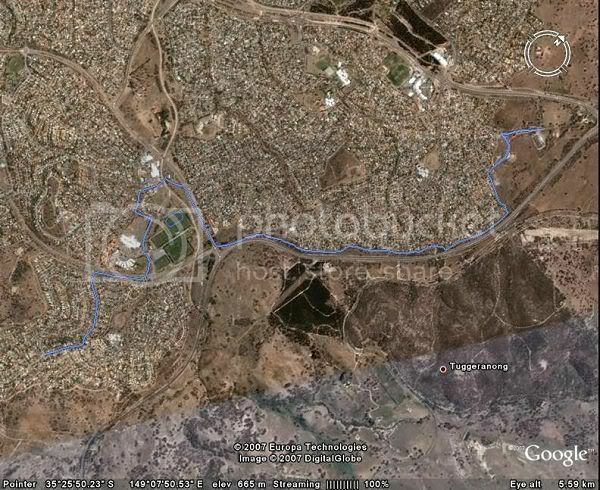 Low HR (76%) out/back Melrose River, then bike path to Monash Ridge and return in 95:40 (6:20/km). Ave HR 126, MHR 132. Got caught in the rain. Mild, wet then hot. Week 01 80k - A good week to start the year. Weight 75.0kg. 8 Jan 15.3 Speedygeese. Early warm-up with Geoff 7k easy. 4 person relay 620m 'hard', 930m recovery. I ran moderately, 5:40 - 6:00/kms. Quite tired and right heel niggly. Warm and smoky. 9 Jan 7 Track, Calwell. 2.5k warm-up 15:25. Two sets 5 x 200m, first with Karen. 1:45 walk recovery 2nd set, longer on first. 43.9, 42.8, 41.7, 44.0, 42.2 / 40.8, 39.8, 40.0, 39.6, 39.5 (41.4 ave = 3:27/km). Frees. Felt OK. 2.5k warm-down with Karen, Kathy and Tom in 15:19. Mild, sunny, breezy. 10 Jan 8 From PH with Chris; also Dennis (back from Adelaide) and Chantelle. Normal run, with a short-cut at Reconciliation Place, 49:50 (6:14/km). Very easy, with some walking. Hot. 11 Jan 5.3 Race: 5000 metres. First 5k of ACT 10,000m Championships in 23:09.3 (4:38/km). Frees. Splits: 4:27, 4:32, 4:45, 4:48, 4:37. Ave HR 156. With CJ for 2k then she left me for dead. OK but can improve. No injury problems :) LLs ran a 15sec PB for 800m (4:16.54). Hot! (35C). 12 Jan 8.1 7.40pm. Out/back via Calwell High and bike path to new roundabout Johnson Drive in 51:26 (6:21/km). Trying to run at low heart-rate. Ave HR 126, MHR 131. OK, no soreness. Hot, still. 13 Jan 30.2 Steve's 6' group, Molonglo 7:13am. To War Memorial, Mt Ainslie, Trent's, Rollercoaster, War Memorial, Mt Ainslie, Campbell Park in 3:44:57 (7:27/km). First 18k with (more or less), Steve, John, Cathy at 6:40/km. Lots of walking from then on. General leg soreness the main problem. Cool then warm. 14 Jan 7.1 7.40pm. Out/back - Calwell High, church carpark to Johnson Drive roundabout in 44:36 (6:17/km). Well controlled low HR run. Ave HR 125, MHR 130. Slight left hamstring niggle. Warm. Week 02 81k - 5000 metres was 10 seconds disappointing. Weight 75.5kg. 15 Jan 15.5 Speedygeese. Early warm-up 7k, Yacht Club & Stirling Hills. Relay with Strewth 3 x 820m, 300m jog. All at a steady pace - 96:25 (6:13/km), Ave HR 135. A bit tired, but legs OK. Hot. 16 Jan 5.7 Calwell. 2.5k warm-up with Kathy (her warm-down) in 13:40, ave HR 137. Slow Race Test - 3000m in 16:24 at ave HR 138. Start HR 122. Splits: 5:09, 5:36, 5:39. Frees. OK. A fresh breeze (Braidwood Doctor) arrived as I started at 6.30pm. Running into it up the hill. Hot. 17 Jan 10.7 PH with Chris, Dennis to Civic pool bridge, then with Cathy - Central Basin, back via Nara Park in 60:56 (5:42/km). Ave HR 134, MHR 140. Tired, otherwise OK. Hot then a stormy cool change. 18 Jan 7.6 Track, Calwell. 2.5k warm-up 15:15 @ ave HR 124. Two sets 6 x 200m, 1:45 walk recovery. 43.2, 41.4, 39.9, 41.4, 39.6, 40.1 / 39.5, 39.5, 38.8, 39.1, 39.1, 40.0 (40.1 ave = 3:21/km). Frees. Felt good in warm-up. Still struggling for speed. 2.5k warm-down in 15:46. Warm, stormy looking, windy. 19 Jan nil Rest day before tomorrow's probably difficult long run. Should also help settle few minor niggles I've had this week: left upper hamstring, left inner knee, right inner calf. Hot, fine. 20 Jan 22.1 Molonglo 7.11am. Around Mt Ainslie via Campbell Park with group - Anzac Pde with Ruth to lake, East Basin Wetlands. 2:23:35 (6:30/km), AHR 130. Felt good. Swim afterwards. Fine, hot! 21 Jan 12 6pm. Out/back - Calwell High, Tuggeranong Homestead, Ashley Drive, Monash aiming for low HR. 72:54 (6:05/km) at Ave HR 125, MHR 131. Felt good. Overcast, mild, some light rain. Week 03 74k - Good week. Happy with track and long run. Weight 75.0kg. 22 Jan 14.7 Speedygeese. Early warm-up 8k to lake, Telopea Park @ 5:50/km. Session of 90m hill repeats, jog down. Very tired, so jogged (walked steep bit). 93:12 total (6:20/km). Ave HR 133. Warm. 23 Jan 6.9 Track, Calwell. 2.5k warm-up 15:16 @ AHR 125. 5 x 300m, 1:50 walk recovery - 64.6, 63.7, 63.1, 64.1, 65.6 (64.2 ave = 3:34/km). Frees. Max HR 159, recovery HR 96 to 114. 1 x 200m in 42.4. Wanted to do more, but too damn tired. 2.5k warm-down 14:03. Warm and windy. 24 Jan 11.4 PH - Chris, Dennis to Civic pool, then with Cathy, George & Ruth. Central Basin, Nara, back of PH in 69:15 (6:05/km). Ave HR 124. Felt good. Warm, but a cool easterly breeze. 25 Jan 6.4 Track, Calwell. 2.5k warm-up 15:24. 6 x 200m, 1:42 walk recovery - 39.9, 38.7, 38.9, 38.5, 39.8, 38.4 (39.0 ave = 3:15/km). MHR 160. Frees. Best yet, but not easy. 2.5k with Kathy in 13:46! Warm, windy! 26 Jan 8 7pm. Low HR out/back - Calwell High, Tuggeranong Homestead to Ellerston Ave in 49:53 (6:14/km). Ave HR 124 (75%). Felt OK. Slowed on hills to keep HR down. Warm then a cooling breeze. 27 Jan 30.1 Molonglo 6.40am. Lap of Duntroon, then with group to Trent's. Back to War Memorial via Trent's, Rollercoaster with Steve, John and Cathy. Home alone via Mt Ainslie (walked), Campbell Park. 3:27:42 (6:54/km), AHR 133. OK (cooler weather helped) although tired last 4km. Mild, 20C, cooling breeze. 28 Jan nil A rest day. Perhaps a 'white' session? I was planning a low HR short run, but fell asleep watching the cricket and ran out of time. Legs fine after yesterday. Warm and sunny. Week 04 77k - Good track & long run. Weight 74.5kg. 312km last 4 weeks. Week 05 86k - The 5000 metres was worth every 2 penny. Weight 74.0kg. 8 Feb nil Rode Apollo to Calwell. Although it was OK on yesterday's run, the top of my right foot was slightly niggly. Decided to give it a day off; try an easy run Friday. Mild and windy. 9 Feb nil Right foot still slightly niggly. Fingers crossed that it's OK during the long run in the morning! Hot, windy. Week 06 74k - Very happy with the long run and OK foot. Weight 74.0kg. Week 07 90k - Good week, especially Masters' & long run. Weight 74.0kg. 22 Feb nil Ran out of time to run. On duty for the Masters' track & field meeting at 5pm. Dinner afterwards at Zeffirelli's. Hoping to do some training on Friday. Warm, sunny. Week 08 86k - Good last run for 6'. Weight 73.0kg. 336km last 4 weeks. 1 Mar nil Decided not to run, after a tiring work day. Updated my blog with a final post before Six Foot. Legs feel good. Just need to get the sleep thing happening. Warm, stormy. Week 09 62k - First taper week for Six Foot. All good. Weight 73.5kg. 8 Mar nil AIS track to see Norma race the mile. Unfortunately she had an off-day, running 9:30. Her last 1500m race showed she was capable of breaking the 8:59.4 Australian record. Mild, calm. 9 Mar nil A final 'rest day' before tomorrow's little run in the bush. A bit nervous. Haven't perambulated for six to seven hours since last year's Six Foot. Week 10 65k - Six Foot was fun, but a bit slow. Weight 74.0kg. 12 Mar nil Quads a bit worse than yesterday, but otherwise, no problems. Both achilles slightly sore yesterday morning, but fine today. A perfect day - cool morning, then warm and sunny. 14 Mar nil Quads still tender when I massage them with the fingers. Not too fussed about my lack of running, although a bit of a shame to waste such perfect weather. 15 Mar nil Helping at the Masters' Track & Field meeting. Jogged around a bit while at the Discus and Hammer. Legs feel OK today! Warm. 16 Mar nil Very busy at work; tired afterwards. Decided to save the first run since Six Foot until tomorrow. Warm. Week 11 26k - Ready to get back into it after 6'. Weight 74.5kg. Week 12 74k - Good week. Weight 74.0kg. 227km last 4 weeks. Week 13 83k - Very happy with the 5000 metres. Weight 74.0kg. 6 Apr nil Driving to Wagga for Easter. Warm. Week 14 64k - Good, although missing a long run. Weight 74.5kg. Week 15 84k - Some good sessions. Fitness improving. Weight 74.5kg. 20 Apr nil Not happy that I didn't run. Worked late (10 hours), and thought that even an easy short run would be of little benefit. Need an early night! Beautiful weather again. Week 16 72k - Slow Race Test good. 75.0kg. 303km last 4 weeks. 26 Apr nil Working late. Too tired to run. Mild, fine. 27 Apr nil Groundhog day. Still tired. Week 17 69k - Busy at work; therefore tired. Weight up. 76.0kg. 2 May nil Worked late. Spent the time I would have been running doing some last minute work for the SCT AGM. One day I'll get over my tendency to procrastinate. A beautiful autumn day. 4 May nil Once again, a long day at work left me feeling tired. Could have dragged myself out for thirty minutes, but just didn't feel like it. Week 18 51k - Good to be back racing again. Weight 75.0kg. 11 May nil A rest day prior to tomorrow's 5k race. Last year I ran 22:30, so I'd like to run under 22 minutes. Not all that confident, as I haven't had a great week. Week 19 59k - The 5k could have been better. Weight 74.5kg. 14 May nil Speedygeese group dinner. Banana Leaf Restaurant in Civic (Sri Lankan). Had lamb cutlets + bread and butter pudding. Decided against trying to squeeze in a run before going out. 19 May nil Drove to Mittagong, then by train to Sydney. Week 20 43k - Enjoyed the HM. Weight 75.0kg. 222km last 4 weeks. 25 May nil Decided to have a rest day as I was feeling pretty tired at the end of a busy working week. Week 21 56k - a bit low on miles, but happy with the race. Weight 74.5kg. Week 22 80k - Bad race but otherwise, a good week :) Weight 74.0kg. 6 Jun nil Tired after working late. Had planned to run 10-14k but decided at the last minute to give it a miss. Cold. 8 Jun nil Whoops! That's two days off. A really foul windy day, so decided not to run. Cold, blowing a gale. 4 1.15pm. Easy out/back towards Rose Cottage Inn. 72:32 (5:57/km) @ AHR 131, MHR 137. Legs felt OK.
Week 23 55k - Feeling good. Not happy with 2 days off. Weight 74.0kg. Week 24 88k - A good week. Weight 74.5kg. 279km last 4 weeks. 19 Jun nil Thought I'd give the left groin a day off. Steady, cold rain all afternoon made the decision easier. Cold, wet. Week 25 74k - Training going well. Fadden Pines pleasing. Weight 73.5kg. 26 Jun nil Flew out of Canberra 6.50am for Coolangatta via Melbourne. Drove down to Dad and Marion's (Pottsville), arriving about 2pm. Steady rain all afternoon so I decided not to run. Week 26 68k - Happy with the half. Quickest since 2005. Weight 74.0kg. Week 27 86k - Good week except for the head cold. Weight 74.0kg. 9 Jul nil Head cold, or whatever it is, has got the better of me. 10 Jul nil Still sick. The witch doctor has given me a script for antibiotics and another day off work. 11 Jul nil Aches and pains have gone, but still have a touch of wildthingitis. A shame not to run - it was just about as good as it gets for July in Canberra. 12 Jul nil Today I was well enough to return to work, but probably not well enough to run. Still quite a bit of congestion. May try an easy run tomorrow. Week 28 37k - Bad cold=low mileage. Weight 73.0kg. 265km last 4 weeks. Week 29 96k - A good week - would like more like this. Weight 73.0kg. Week 30 101k - Another good week. Bush Capital was fun. Weight 74.0kg. Week 31 106k - Lower HRs this week on some sessions. Weight 73.5kg. 11 Aug nil A rest day before the City to Surf. I'm hoping I'll feel fresh enough to finish in 65 to 70 minutes. Week 32 91k - Hadd training going well. Weight 74.0kg. 394km last 4 weeks. Week 33 105k - A good week. Thursday was promising. Weight 74.0kg. Week 34 108k - Another good week. Getting somewhere. Weight 74.0kg. Week 35 106k - Another good week. Still improving. Weight 74.0kg. Week 36 98k - Good week. SRT pleasing. Weight 74.0kg. 417km last 4 weeks. 14 Sep nil A rest day. I really need it. Work has been very hectic this week. Week 37 97k - Good week, but a bit tired. Happy with the race. Weight 74.5kg. Week 38 95k - Struggling a bit with work and training. Weight 74.0kg. Week 39 103k - Good week. Improved Hadd Test. Weight 73.5kg. 3 Oct nil A rest day. Needed it - pretty tired from a very long day at work. Warm, extremely windy! Week 40 76k - A good half! Weight 73.5kg. 371km last 4 weeks. 9 Oct nil Intended to run, but very busy at work - 11 hours. Also, a niggly left hamstring. 12 Oct nil Rest day. Tired. Week 41 57k - Not great. Busy at work. Weight 74.5kg. Week 42 109k - A good week. No problems. Weight 74.0kg. 26 Oct nil I decided rest would be wise considering the woefulness of yesterday's run. Feeling better physically after 9 hours' sleep, even though it was a long working day. The sore throat has improved. Storms, rain. 28 Oct nil Need to stop running until I'm over this cold! Week 43 73k - Good until Wednesday, then bad. Weight 74.0kg. 29 Oct nil Still sicko. Worked, but finished early and didn't run. Feeling better than I was yesterday. 3 Nov nil Took my gear to Interclub with the plan of running in the 3000 if I was feeling OK. A silly idea! Kathy ran an Australian W50 record - 10:42ish. Week 44 72k - Not a great week or month. Weight 74.0kg. 311km last 4 weeks. 9 Nov nil I had planned to run. Feeling tired after working 10 hours, the final straw was the weather, which turned nasty. Steady rain and occassional thunder. Week 45 105k -Finally getting over the cold. An OK week. Weight 74.0kg. Week 46 104k - Good week. Stromlo race was fun. Weight 73.5kg. 22 Nov nil Race: Masters' 10,000m track. Didn't get to race. The meeting was cancelled due to rain. 23 Nov nil Worked late. Tired. Week 47 58k - Disappointed about the cancelled 10,000. Weight 74.0kg. Week 48 100k - A good training week. Weight 74.0kg. 367km last 4 weeks. Week 49 95k - A great week! The 5k race was my best for many years :) Weight 74.0kg. 12 Dec nil Tired. Worked 11 hours. Not happy to miss a day, but running would have been just for the numbers. Week 50 75k - OK considering tiredness from work. A good 3000m. Weight 73.5kg. 17 Dec nil Speedygeese group dinner at the Banana Leaf, Civic. 19 Dec nil Worked 11 hours. Too knackered to run. Week 51 61k - A couple of OK runs salvaged an ordinary week. Weight 74.0kg. 24 Dec nil After work, drove to Wagga Wagga for Christmas; arriving 8pm. Week 52 88k - A good week to finish 2007. Weight 73.5kg. 319km last 4 weeks. Goals: In terms of numbers, only one goal achieved: Six Foot Track in 6 hours 30 minutes (6:24:55). 1500 metres - didn't race one. 3000 metres - 12:15.43 (over by 36 seconds). 5000 metres - 21:45.27 (over by 60 seconds). 10k road - 45:55 (over by 2:22). Gold Coast Half - 1:45:11 (over by 9:42). Nail Can Hill Run - 59:17 (over by 3:17). City to Surf - 69:37 (over by 7:37). In abstract terms, one goal was achieved which I didn't think possible at the beginning of the year. In December I finished ahead of my long-time rival, Jim W (and other formerly "unbeatable" runners) in a race at Stromlo Forest Park. 13 December - 3000m in 12:15.43 showed that sub-12 is possible. 7 October - Melbourne Half Marathon in 1:40:48 showed that Hadd-training is working. 6 December - 10,000m in 44:54.57 was my best for two years. Numbers: I ran 4,123 kilometres, an average of 79.3 per week. The biggest 4-week period was August/September with 417km, and smallest April/May with 222km. There were 51 days when I didn't run. Heart-rate percentages are based on my maximum of 166/min. Other words: In June I decided to follow Hadd-training for 12 months after reading once again his Approach to Distance Training document. The outcome so far is promising in terms of race results, with one race in particular (the 5k at Stromlo on December 4) standing out. In 6 months' time I hope to draw some conclusions about Hadd-training. My 2008 training diary.